The range caters for small footprint boilers that are designed to fit into small spaces, through to more traditional higher capacity and higher pressure products. 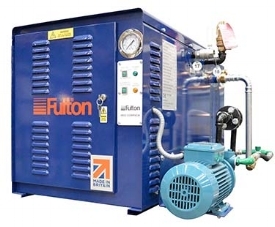 The Electropack is Fulton’s versatile seven-model range designed for steam loads between 29 and 153kg/h. It is fully packaged in an attractive modern case and all services are connected at the rear for easy installation. The Electropack offers unrivalled flexibility and mobility in a compact unit that occupies minimal floorspace. It is easily moved to provide point-of-use steam wherever required and the heating elements are individually switched to allow the boiler to respond quickly and efficiently to variable steam demands. The Electropack range is ideal for “clean environments” in applications such as pharmaceutical, medical, chemical and food and beverage processing. The EP18-EP72 models have an integrated feedwater tank and feedwater pump, all in one compact unit. The EP100 is supplied with a separate feedwater tank. The Electropack will fit through a standard door opening, making it easy to install in office and laboratory environments.